Tomer's Take: On Friday ski Steamboat, Loveland, A-Basin, Breckenridge or Winter Park, on Saturday ski Schweitzer, Whitefish, Big Sky or Banff, and on Sunday ski Banff (looks very windy though) or in the Northeast. 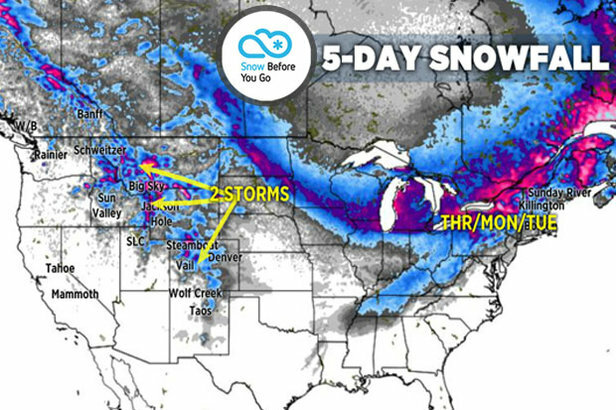 The Western storm track shifts north into Canada over the next five days setting up a series of smaller Clipper-like storm systems on a northwest flow pattern for the Intermountain West. In the Northeast, a large storm system on Thursday starts as rain then changes to snow then ushering in much colder air for the weekend. We are still in "El Nino Watch". The sea surface temperatures have actually cooled slightly since December. 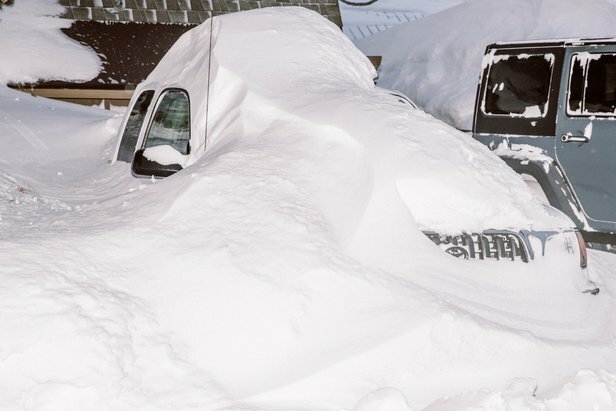 The official forecast calls for a 65 percent chance of El Nino developing this winter. Snow ends early Thursday morning, then the jet stream shifts north resulting in only fast-moving, light snow chances through the weekend. A slightly better chance of snow by Tuesday-Wednesday. Two storm systems keep the snowfall going between Thursday and Sunday. Heavy snow accumulations likely. Friday might hold the heaviest accumulations. The jet stream shifts north resulting in only fast-moving, light snow chances through the weekend. A slightly better chance of snow by Tuesday-Wednesday. The jet stream shifts north resulting in a mostly dry five-day period. Will it change? Possibly by mid to late next week. Two different fast-moving storm systems will ride a northwest flow pattern over the next five days. The first occurs Wednesday afternoon through Thursday and the second between Sunday night and Monday. Both deliver light to moderate snow accumulations to the ski areas in Utah. Colorado appears to benefit the most and in some cases with heavy snow accumulations in the Central and Northern Mountain zones. Look at Alta, Snowbird and Snowbasin in Utah on Friday and Monday. In Colorado look at Loveland, A-Basin, Breckenridge, Winter Park, Vail and Steamboat through Monday. 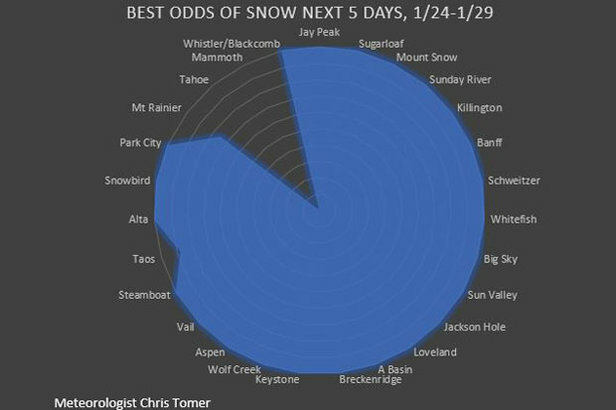 Ski Resorts with the best chances for snow through this weekend, 1.24.2019. Two different fast-moving storm systems will ride a northwest flow pattern over the next five days. The first will taper off on Thursday midday but light snow lingers into Friday, and the second occurs Sunday afternoon into Monday. Each delivers moderate snow accumulations to the ski areas. Look at Schweitzer, Whitefish, Big Sky, Bridger Bowl, Jackson Hole, Grand Targhee and Sun Valley with the first storm. The second storm system favors Big Sky, Jackson Hole and Grand Targhee. A large storm system starts as rain at the ski areas on Thursday then quickly changes to snow. Much colder air settles in through the weekend with periods of lake effect snow. A fast-moving storm system with light to moderate snow hits between Sunday afternoon and Monday. A larger storm system is possible on Tuesday. The best skiing occurs on Friday and Monday. Look at Jay Peak, Wildcat, Sugarloaf and Killington.